Egypt, 1912 - Amelia Peabody and her dashing archeologist husband, Radcliffe Emerson, are once again in danger as they search for a priceless, stolen bust of legendary Queen Nefertiti and Amelia finds herself the target of assassins in this long-awaited, eagerly anticipated final installment of Elizabeth Peters' bestselling, beloved mystery series. Arriving in Cairo for another thrilling excavation season, Amelia is relaxing in a well-earned bubble bath in her elegant hotel suite in Cairo, when a man with knife protruding from his back staggers into the bath chamber and utters a single word - "Murder" - before collapsing on the tiled floor, dead. Among the few possessions he carried was a sheet of paper with Amelia's name and room number, and a curious piece of pasteboard the size of a calling card bearing one word: "Judas." Most peculiarly, the stranger was wearing a gold-rimmed monocle in his left eye. It quickly becomes apparent that someone saved Amelia from a would-be assassin - someone who is keeping a careful eye on the intrepid Englishwoman. Discovering a terse note clearly meant for Emerson - Where were you?" - pushed under their door, there can be only one answer: the brilliant master of disguise, Sethos. 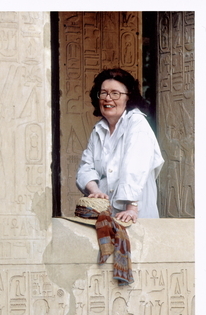 ELIZABETH PETERS, whose New York Times best-selling novels are often set against historical backdrops, earned a Ph.D. in Egyptology at the University of Chicago. She also writes best-selling books under the pseudonym Barbara Michaels. She lives in Frederick, Maryland. Goodreads reviews for The Painted Lady.